The database was recorded in 2009 at the UPC smart-room with 5 calibrated cameras and 6 T-shaped 4-microphone clusters. The database includes two kinds of datasets: 8 recording sessions (S01-S08) of isolated AEs, where 6 different participants performed 10 times each AE (about 15 min each session), and a spontaneously generated dataset which consists of 9 scenes (T01-T09) about 5 minutes long with 2 participants that interact with each other in a natural way: discuss certain subject, drink coffee, speak on the mobile phone, etc. Although the interactive scenes were recorded according to a previously elaborated scenario, we call this type of recordings “spontaneous”, since the AEs were produced in a realistic seminar style with possible overlap with speech. Data has been manually annotated. 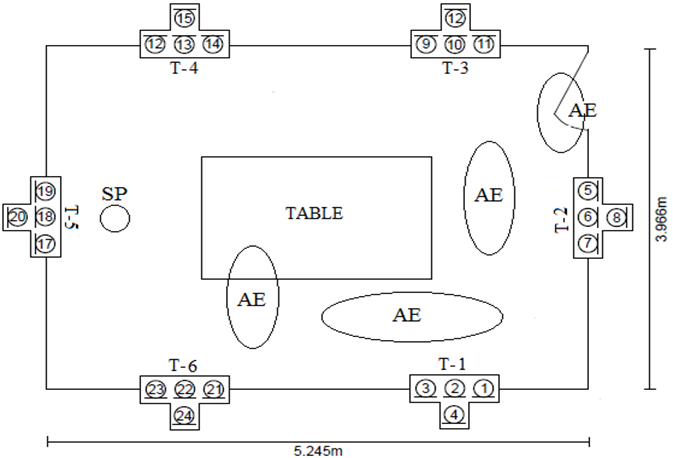 The approximate source positions of the acoustic events (AE) are shown in the figure, along with the positions of the 6 T-shaped 4-microphone arrays on the walls of the UPC smart-room. All audio signals were recorded at 44,1 kHz sampling frequency. It is distributed through UPC, without cost. A license agreement must be signed by the receiving institution.